Now that Commonwealth Court Judge Robert Simpson has given the green light to Pennsylvania’s strictest in-the-nation Voter ID Law, tens of thousands of Pennsylvanians will have to make their way to their local PennDOT office to get a photo ID. We can tell you, it won’t be easy. This summer, the Pennsylvania Budget and Policy Center recruited volunteers to visit PennDOT offices across the Commonwealth and tell us about their experiences trying to obtain free photo ID under the new law. The results of that survey are in our new report, Pennsylvania’s Identity Crisis: Rushed Implementation of Voter ID Law Puts Voting Rights at Risk. 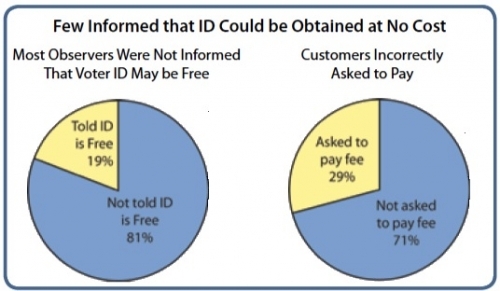 The report finds that voters are likely to be frustrated in their attempts to secure a free ID from PennDOT. Some volunteers found the offices weren’t open the first time they visited and they had to return another time. There was no signage and limited information in half the sites, and the forms needed to secure a free ID were not available most of the time. In almost half the cases, voters received information that proved to be incomplete or inaccurate from staff at the centers. Problems were as likely to occur in Franklin and Luzerne counties as in Philadelphia or Allegheny County. Providing a free ID to anyone who needs it is one of the key constitutional tests of the validity of a state’s voter ID law, and we found Pennsylvania is not making the grade. Most volunteers were not told they could have an ID for free, and in 30% of the visits, they were told incorrectly they had to pay. We report on a man who took 16 people from his church to the PennDOT at 8th and Arch Street in Philadelphia, where they were told incorrectly they had to pay for a photo ID. Twelve of the 16 didn’t have the money with them and left empty-handed. The Department of State is rolling out a new Commonwealth ID next week, which may end up creating more problems than solutions. The bottom line is that the Commonwealth isn’t ready to get an ID to everyone who needs it for the November election, and unless we put on the brakes, people will be disenfranchised. They sure ain’t making it easy.